I remember how I began 2012: in Central Otago, the peak of summer, drinking local wines and eating freshly picked stone fruit. We all sat outside on the first day of the year, in short sleeves, probably drinking rosé, rolling the number around on our tongues, 2012. It sounded good, clean, even. It was going to be a good year and, for the most part, it was. I was sorry to see 2012 roll ever so easily into 2013, with little ceremony or pomp. Thank goodness for Christmas. Christmas always seems a far better way to say good-bye to one year and welcome in the next, and our Christmas this year, well, we let 2012 go out with a bang. On Christmas Eve, the temperature in the late 20s (celsius), Mum and I made mayonnaise, furiously whisking until perspiration glistened on our foreheads. But it was beautiful mayonnaise, the real deal, a shiny yellow and a flavour that you just want to keep in your mouth. The next day was hot, fan yourself with your napkin hot – the hottest Christmas day in Wellington since 1934. We started with fresh summer fruit – melon, green and coral pink, nectarines and white flesh peaches, strawberries and plump blueberries. We stuffed a turkey breast then set a leg of lamb onto roast. I stirred a handful of finely diced dill into half of the mayonnaise and wasabi into the other half, just enough to make the back of your throat tingle. 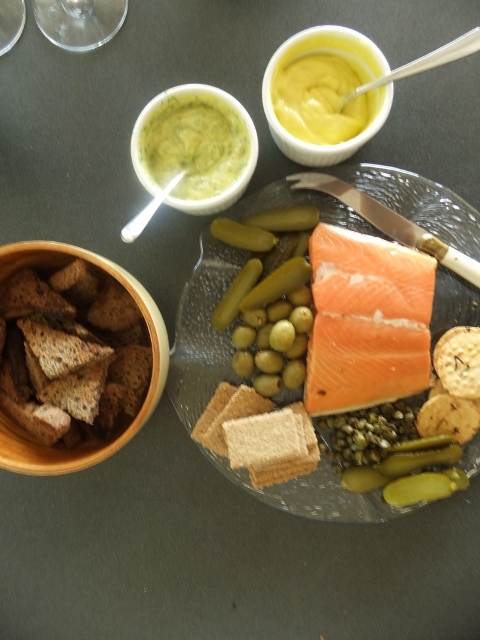 We began with a smoked salmon platter – buckwheat toasts, fried capers popped open like crunchy salty flowers, gherkins and oat crackers, and so began our afternoon, a tide like motion of ebbs and flows between the kitchen and the table. 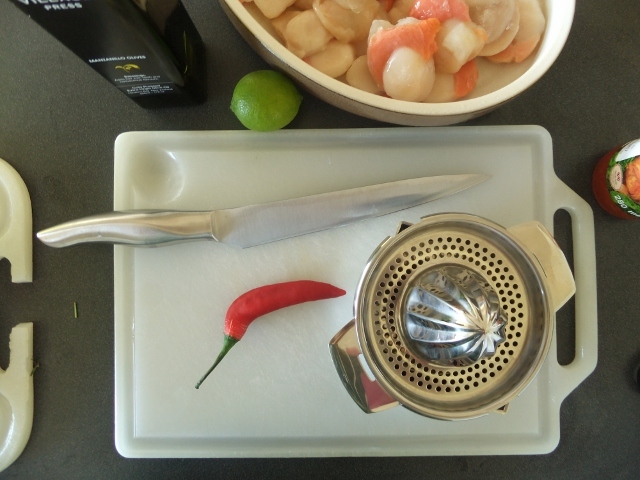 There were scallops marinated with citrus, chilli and coriander – their delicate orange and cream spheres bursting with a soft sweetness and a mere whisper of heat. 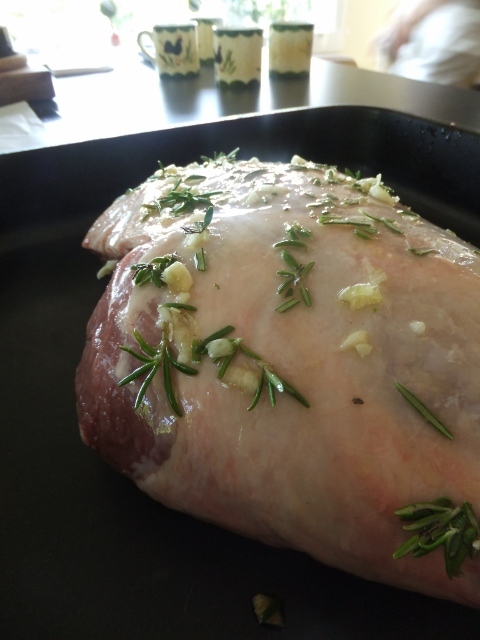 There was the leg of lamb, rubbed down with rosemary and garlic and roasted to a perfect medium – sweet, savoury, herbaceous – New Zealand lamb at its best. 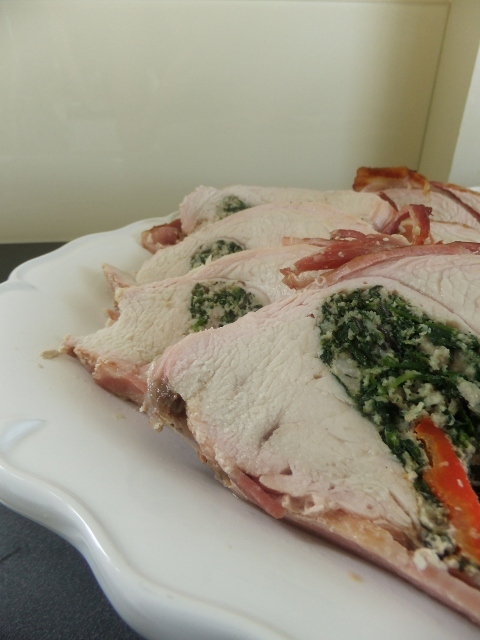 A turkey breast nearly halved, flattened and therapeutically beaten then stuffed with Big Bad Wolf sausage, char grilled capsicum and spinach from our garden. 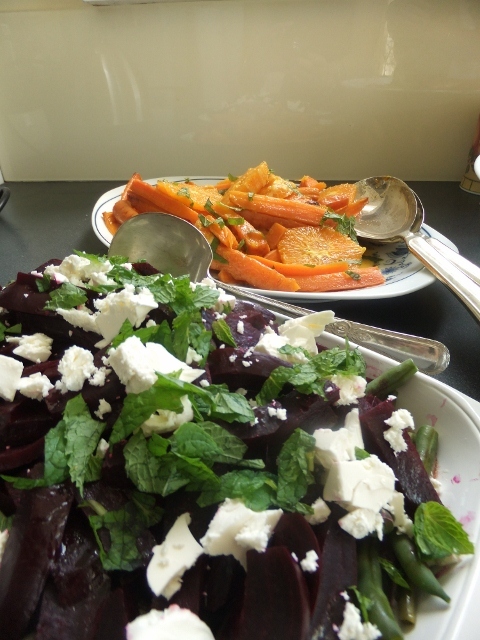 Our favourite Christmas salad, a trio of red, green and white, green beans blanched to a pleasing snap and brighter colour, crumbled feta with plum coloured smudges from the roasted beetroot. Boiled new season potatoes, the joy of summer Christmas, with curls of butter and torn herbs. 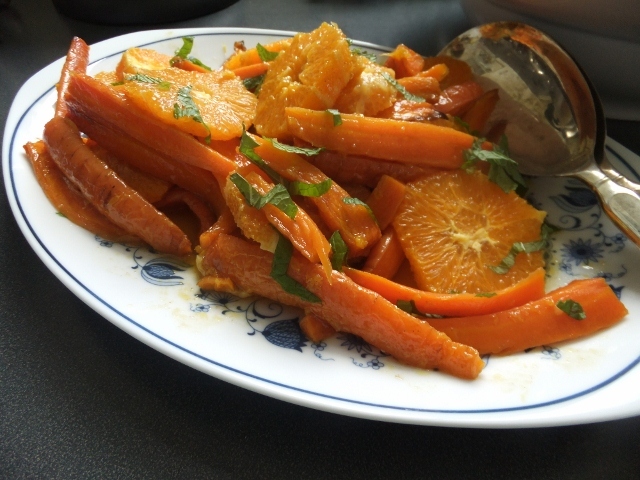 Then this salad, my new favourite, roasted carrot and orange salad. It is no secret my love of roasted carrots – their tender sweetness and bright warmth pull me in every time, no matter the weather. 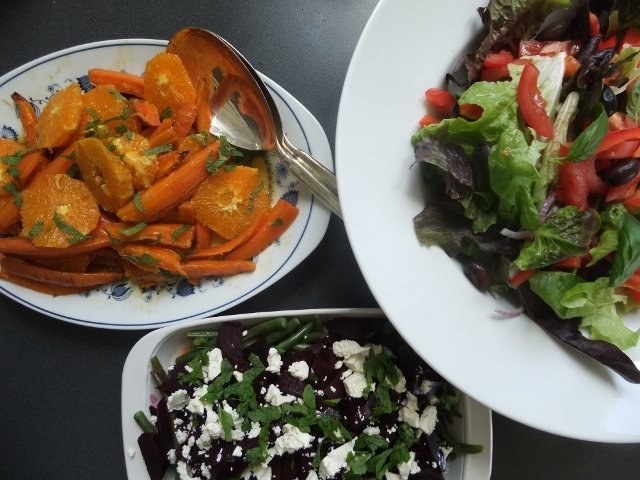 The salad is a wonderful mess of shapes, colours and textures – long rectangles and full rounds, burnt orange and near yellow, flecked with dark spices. In between courses we drank lemoncello, declared how much we all love it, and opened another bottle of Riesling. 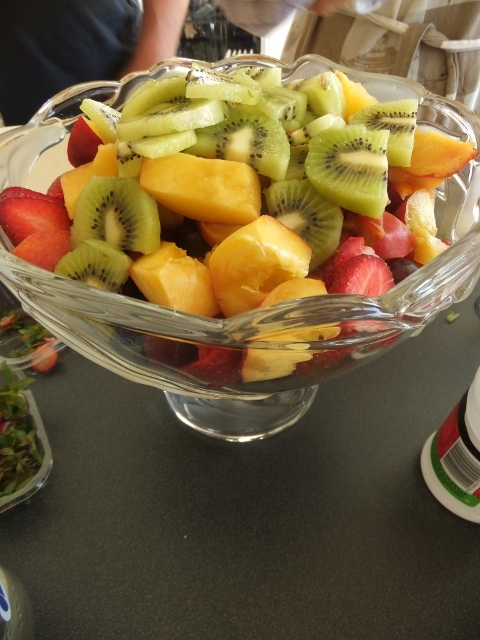 My uncle Adrian and his partner Nicola made dessert: fresh fruit of every colour, strawberries, grapes, nectarines, peaches and my first raspberries of the season. A dairy free and gluten free trifle that, had we not been told the slight nutty flavour was rice milk custard and the nubbly texture a ground almond sponge, would have fooled us for the more traditional cream and plain flour variety. We ate trifle by the bowl full. There were home made brandy snaps – thin and wafer biscuit like, holding within their lacy edges the taste of real ginger rather than a generic sweetness like the store bought sort. We filled them with cream as we ate them – fill, bite, fill, bite. It’s mid-January already. Christmas feels long gone and with it, 2012, but the feast we shared that day seems a good a way as any to welcome in a new year. There is not much we can do about the speed at which the years change, except to live each year wholly and fully. Perhaps that is why I loved 2012 so much and, also why I have barely realised 2013 is well under way. Taken from the Cuisine Christmas issue 2010 The salad is a cinch to make if you happen to have a bottle of orange blossom water lying around, but I’m sure it will be fine without. Pre-heat oven to 200°C. 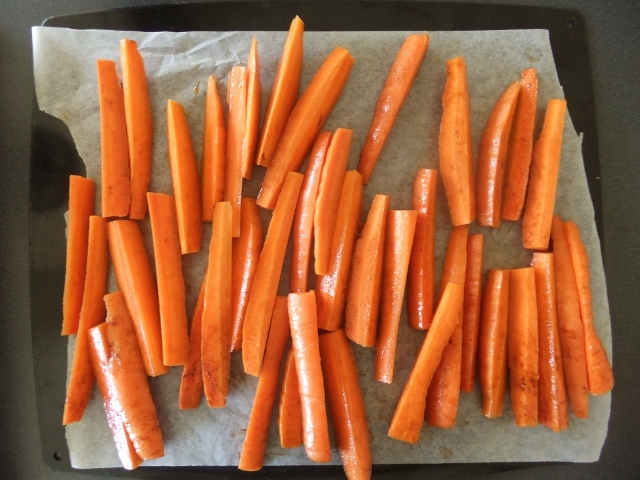 Place the scrubbed and cut carrots in a bowl with 1 tablespoon of the oil, cinnamon, cumin and salt. Stir well to combine. 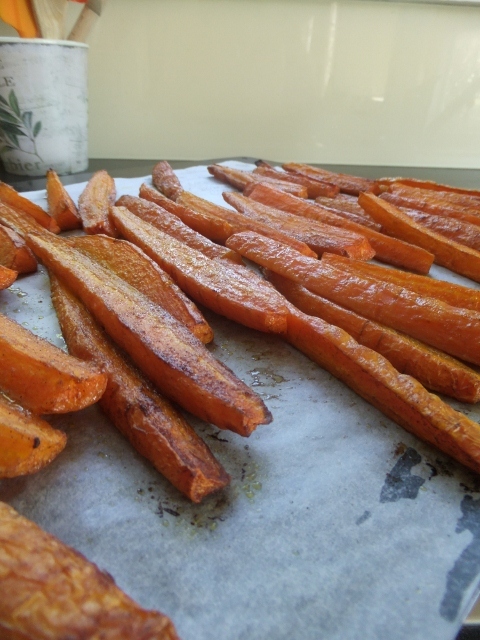 Place on an oven tray lined with baking paper and roast for 40 minutes or until tender. Meanwhile place the juice of one orange in a large bowl with the remaining oil, sugar and orange flower water. 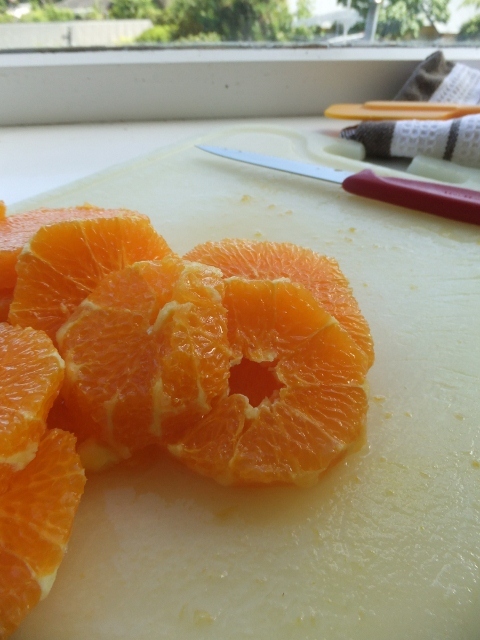 Slice the rind and the pith off the oranges and slice into rounds. Set the orange slices to one side. When the carrots are cooked add them to the orange vinaigrette and set aside. The salad can be served warm or cold so just before serving add the sliced orange rounds and sliced mint, toss well and place on a serving dish. This salad goes very well with lamb.